New research published last week in Journal of the Royal Society Interface examines the sniffing behaviour of terrestrial hermit crabs. Sniffing in humans means drawing in a sample of air into an enclosed space, our nasal cavity. It's different for crabs; they detect smells externally using a set of antennae located between their eyes. These are covered in special chemosensory hairs which are permeable to a variety of odour molecules – including vomit – and to water. To sniff, crabs wave or flick their antennae to generate currents through the hairs, bringing smells close to sensory surfaces. But not all crabs sniff in the same way; it depends where they live. Marine crabs sniff by flicking their antennae back and forth, trapping fluid in the spaces between hairs during the rapid downward stroke and holding the water sample during the slower return stroke. This clever trick of fluid dynamics, where they can either take a new sample of water or hold it by changing the speed of antennae movement, allows time for smells to be detected in an aquatic environment. Terrestrial crabs do not sniff in the same way. They flick their antennae too, but the hairs are too short, flat and closely spaced to suggest they use the same trick as marine crabs. Instead, odour molecules are detected not from the air between hairs but from air flowing around the outside of the antennae. Unlike marine crabs, a flick – or sniffing – does not replace an odorous sample with a new one, but land crabs can get away with this because diffusion is so much faster in air than water. Lateral (a) and ventral (b) view of the hairy antennae of the hermit crab. First author Dr Lindsay Waldrop said about the results: "We were surprised because discrete sampling is so important for a lot of marine crustaceans during olfaction. It has a big effect on how much odour a crab can detect, and how sensitive their antennae are to low concentrations. And now we have this crab that throws that function right out the window." But, as this paper shows, land crabs can achieve sensitive sniffing too. Flicking their antennae increases molecule capture by 21% compared to when they are still, so a burst of flicking followed by a pause can deliver separate samples of air to sensory surfaces so that smells can be detected easily. The mechanism of sniffing in land crabs was previously unknown until now. 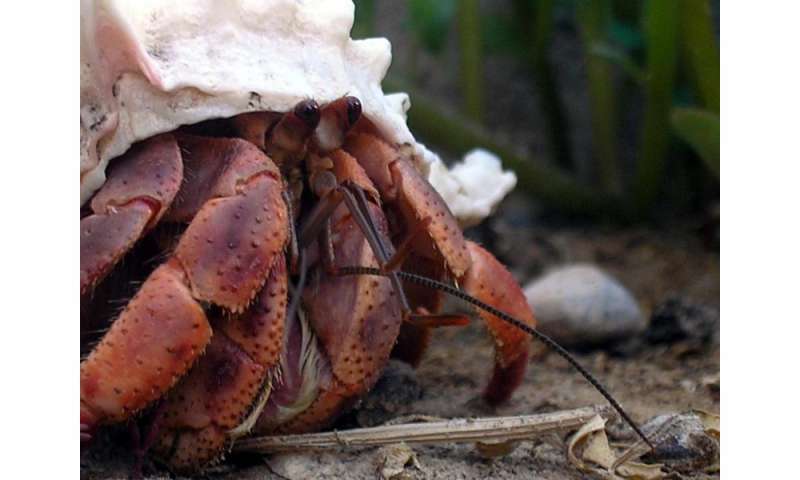 Here's a hermit crab in action, sniffing away.